The total number of books that are now available in the school library and classroom: ZERO! To provide audio books for the Learning Centre. Audio books are essential tools used to teach language skills. The school is going to host a Reading charity event in March to raise money and awareness for this cause; Untitled Chapters will be participating in that week with our own contribution. Conducting Creative Writing Workshop for these students, have them write a story and then produce a book with all of the stories that the students wrote; which means that they will practically have their work printed and produced in an actual physical book. This book will be placed in each classroom. Having that book in hand; we know that we can inspire at least one girl to have more of her stories published in the future. If you would like to be a ‘Donation Station’ and help us collect book donations from around the Emirates we would be grateful! Tell us which Emirate you can collect donations from and we will contact you when there is a donation that needs to be picked up in your area. Are you fluent in English AND Arabic? We are in need of people to translate different materials from English to Arabic. If you’re interested, we’d love to have you on board! 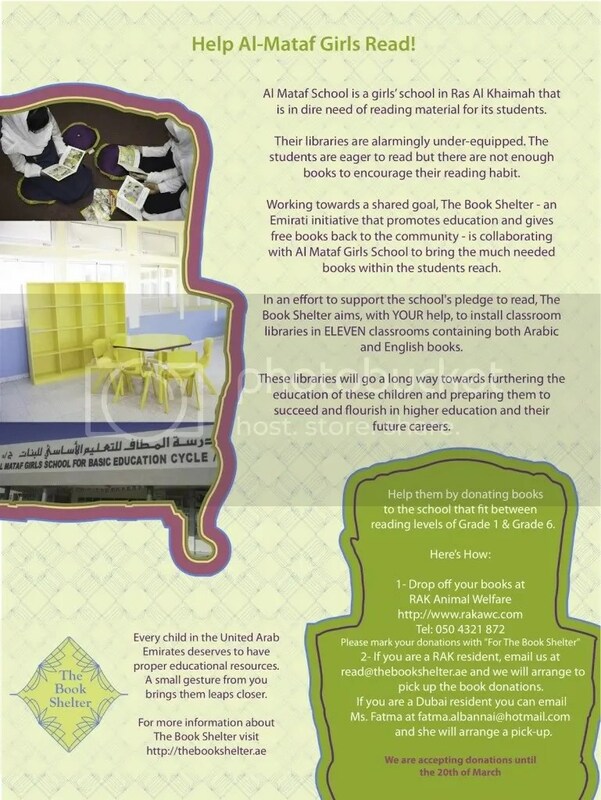 The Teachers at Al Mataf Girls School want to encourage their students to read by pasting inspirational posters around the school relating to reading and books. Are you a designer who can design posters? Do you want to donate purchased posters to this school? Would you like to take care of printing/copying costs?